Today, Walkers dominates the British crisp market, with a 55 percent share. This wasn’t always the case: Smith’s Crisps supplied almost every pub and hotel in Britain in 1949. How did Smith’s lose its dominant market position? Frank Smith (1875 – 1956) was born at Highgate, London, one of a family of 14. From the age of ten he joined his father’s green grocery business. Smith was a manager of a large grocery store by 1896. Smith then became a manager for a Smithfield wholesale grocery business. The business introduced potato crisps, a relatively new product, from 1913. Smith recognised the potential for the new product, and at his request, was appointed head of the crisp department. He wanted to establish a chain of factories to build scale in the market, however his employer declined to do so. Consequently Smith entered into crisp manufacture for himself from 1919, raising £10,000 with two friends. The first factory was a disused garage in Cricklewood. The fledgling business had a staff of twelve in 1920. Within six months, the business was producing 500,000 packets of crisps a week. The enterprise proved successful enough that Smith only had to spend £6,000 of his initial capital: further expansion was funded entirely from profits. Additional factories were opened in Portsmouth, Birmingham, Paisley and Stockport in 1921. 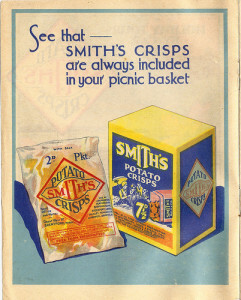 Smith’s Potato Crisps went public in 1929, by which time there were seven factories. 100 million packets of crisps were produced each year. All of the early output went to hotels and pubs, and this would remain the largest market for Smith’s until the 1960s. 200 million packets of crisps were sold in Britain each year by 1934, 95 percent of which were manufactured by Smith’s. To ensure supply, Smith’s acquired 8,000 acres of farmland in Lincolnshire, which provided around ten percent of the company’s potato requirements. Due to crop rotation, only between 1,000 to 1,200 acres were used for potato production at any one time. It was the largest farm under single management in Europe. During the Second World War the majority of production went to the military. By 1949 Smith’s had eleven factories and twelve depots in Britain, and two factories in Australia. Over 2,000 staff were employed. The vast majority of pubs and hotels across Britain were supplied by Smith’s Crisps. This was at a time when pubs did not serve food, and crisps were generally the only bar snack available. 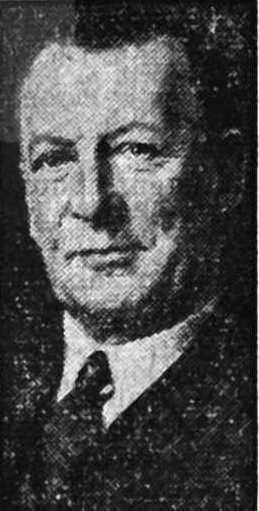 Frank Smith retired as managing director in 1955. He was succeeded by his son-in-law, who was married to his only child. The company was producing over ten million packets of crisps every week by 1956. Net profit after tax exceeded £1 million for the first time in 1960. 800 million bags of crisps were sold in 1960, with the majority of sales taken by the grocery market. Smith’s acquired its major rival, Tudor Crisps, in 1960. Tudor was in the process of constructing a large new factory at Peterlee, County Durham, and Smith’s was keen to prevent a rival gaining control of the new site. Smith’s was the only national brand at the time, but Tudor enjoyed distribution in Scotland, the North of England and the Midlands. Founded in Newcastle upon Tyne in the late 1940s, Tudor was the first company in Britain to use automated crisp manufacture, and had brand leadership in the North East of England. It had a labour force of 160. The Tudor acquisition helped Smith’s achieve a market share of 65 percent in 1961, of which Tudor accounted for three to five percent. Golden Wonder appealed to new customers such as teenagers and children, as well as the increasingly important housewife market. This meant that Golden Wonder was growing the market, rather than poaching Smith’s customers. As Smith’s did not monitor its competition, it did not become aware of a problem until 1966, when its sales fell slightly. Meanwhile, the grocery store sector was growing whilst Smith’s pub snacks market declined. In 1967 the Peterlee plant was expanded to 150,000 square feet to produce eight million packets of crisps a week. By this time it employed 500 people and was one of the most efficient crisp factories in Europe. There were also factories in Belgium, Holland, Ireland and France, as well as Australia. By this time the number of British factories had been reduced to seven. In 1967 the company name was changed to Smiths Food Group, to reflect wider participation in the savoury snacks market, such as roasted peanuts. Company focus was switched from production to marketing. The company’s first flavoured crisp, Salt ‘n’ Vinegar, was launched by Tudor in Spring 1967, and the Smith’s branded version was released two months later. It was the first time the now iconic British crisp flavour was introduced. However, the flavoured crisp had been pioneered by Tayto of Northern Ireland in the late 1950s. 1967 also saw Smith’s replace translucent paper (glassine) with cellophane film bags which increased shelf life from a few days to over six weeks. Smith’s had long claimed to manufacture a high quality product, but Golden Wonder achieved higher standards with the continuous batch process. Growing Golden Wonder cost Imperial Tobacco £10 million, mostly in factory costs, and due to a high marketing spend the business ran at a loss until 1965. Smith’s had presumed that the barrier costs of entry were too high for a competitor to match. They were wrong and it cost them. Largely due to these concerns, Smith’s was taken over by General Mills of America in 1967 for £15-16 million. Smith’s introduced Quavers in 1968, and Monster Munch in 1977. These were part of the new “extruded snacks” category, which were made using potato flour. (Golden Wonder launched Wotsits in 1970). Meanwhile between 1962 and 1969, Walkers quadrupled its sales. In 1971 Walker & Son of Leicester sold the company to Standard Brands of America. In 1972 Golden Wonder had a market share of 39 percent, Smiths 32 percent and Walkers 12 percent. Still heavily regional, by 1974 Walkers claimed 50 percent of the Midlands crisp market. Walkers was a premium product with a heavy marketing spend that sold mainly to the wholesale trade. Smith’s became loss-making under General Mills, who sold the company to Associated Biscuits for £16.4 million in 1978, explaining that a British concern would likely be better tuned in to the needs of the company. Standard Brands merged with Nabisco of America in 1981. Nabisco acquired Associated Biscuits in 1982, thus bringing Walkers and Smith’s under single control. Walkers was still regional at this time, but a rival executive described the brand as “the Rolls-Royce of the crisp world”. Nabisco put its marketing strength behind Walkers, and turned it into a national brand. Walkers took the lead in the crisp market in 1983 with a 24 percent share. Golden Wonder had 22 percent and Smiths/Tudor had 17 percent, followed by KP with 12 percent. Taken collectively, Nabisco had a 41 percent share of the UK crisp market. By this time Tudor was considered a downmarket brand. Walkers and Smith’s were managed separately: Walkers was a high margin, high quality regional product, but it suffered from a narrow product range, poor trade relations and no innovation. Smith’s focused on low prices, but this merely resulted in low profits. Hanson Trust (who had acquired Imperial Tobacco) sold Golden Wonder to Dalgety for £87 million in 1986. At this time Golden Wonder claimed the number two position in the British and Dutch crisp markets. In 1988 Smith’s had sales of £145 million; Walkers had sales of £114 million. Walkers Crisps alone had a 32 percent market share. PepsiCo, who owned Doritos and Lay’s crisps in America, acquired Walkers and Smith’s for $1.35 billion in cash in 1989. In 1991 PepsiCo reduced costs and complexity to fund quality gains, innovation and advertising, while product prices were held. Walkers and Smith’s were merged, and the latter brand was phased out. A factory was closed to leave six, nine distribution centres were reduced to five, and staffing levels were reduced by 17 percent. Walkers prices were frozen between 1992 and 1995, despite a 22 percent rise in the cost of raw materials. The main site in Leicester was upgraded to make it the largest crisp factory in the world. Foil replaced plastic bags to improve freshness. Air in the bags was replaced by nitrogen, to further maintain freshness, from 1996. Walkers held 44 percent of the salted snacks market by 1995. Launched in Scotland in 1994, by 1996 Walkers had displaced Golden Wonder as the local market leader. Walkers acquired the Wotsits brand from the struggling Golden Wonder for £150 million in 2002, following disappointing sales of its own similar Cheetos product. Golden Wonder entered into administration in 2006, a victim of the popularity of Walkers. The Walkers site in Leicester produces more than eleven million bags of crisps a day as of 2011.